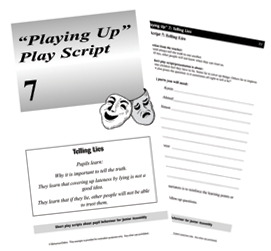 Short Play Scripts focus on behaviour incidents and challenge pupils to think. Designed to be read or performed by pupils themselves in an average of 10 minutes. Plays fit nicely into school or year group assembly. Instead of a teacher speaking in front of the school about behaviour, every few weeks pupils can watch a presentation by the pupils themselves.